Let’s FACE it, we all want to wake up looking refreshed, rejuvenated and like we actually got the 8 hours of sleep we crave and need, when in reality we may only have had a night interrupted by life’s boisterousness: worries that pop up at 2 am, crying babies, hormonal shifts, restless kids, sick dog, snoring partner … you get my drift. Of course, we all must try to find ways to get better sleep, worry less, eat better, and drink more water BUT what if there was a small, quick way to enhance all of your existing efforts while adding self-care into your routine? Let us introduce you to the facial roller! First thing’s first: The Benefits! Facial massage has an abundance of beneficial properties. 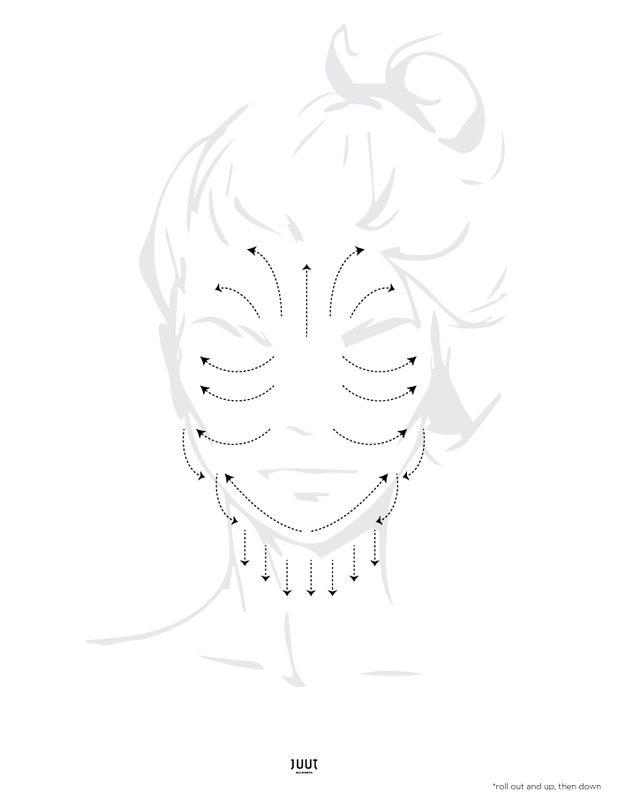 The muscles in the face are often tense and overworked, yet we do not tend to them regularly. We get massages all over our bodies to nurture our muscles, but rarely massage the face. Massaging the skin stimulates the circulation of blood, which leads to stimulating cell growth and preventing new fine lines and wrinkles. Increased blood circulation can also help detoxify the skin; think of it as do-it-yourself lymphatic drainage which helps drain fluid (lymph) out of skin and muscle tissues, leading to less puffiness and more glow! The stimulation of facial muscles helps to bring oxygen to that area which is a natural form of anti-aging treatment in itself. Collagen production is also enhanced by the increased blood flow. Enhance the Experience! When doing a facial massage with the facial roller, amplify the benefits by applying serums and moisturizers 3 – 5 minutes before. Using the roller after the application of serums / moisturizers seals in all the goodness of your skin care regimen. This ritual is the least invasive and when performed regularly, can be very effective in making your skin look youthful and vibrant! Quick Tips: Rolling from the midline of your face outward and up, then down the jawline will assist in smoothing out fine lines and wrinkles, while also directing lymphatic drainage away from your face. See the diagram for a visual representation of the most effective directions to roll. 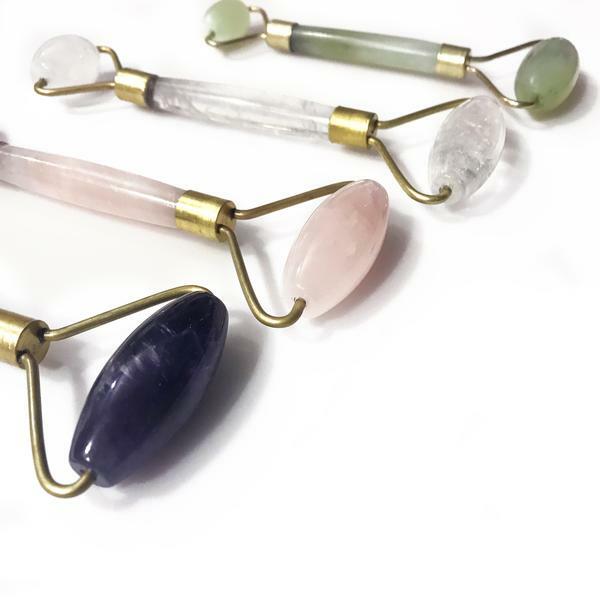 Choose Your Treasure: Our facial rollers come in four different gemstones including rose quartz, amethyst, jade and crystal quartz. Pick a gemstone (either by intuition or from the direction below) and roll away! Rose Quartz: Rose quartz is the ultimate love stone promoting self love in particular. It is also the ultimate beauty stone. Infuses your face with all the properties of rose quartz helping you accept your own beauty and radiate your inner beauty. Jade: Jade is commonly used for making massage tools for the face. Jade represents wisdom, balance and peace. It is a highly calming stone which makes it great for irritated skin conditions. It helps improve skin elasticity, encourages lymphatic drainage and helps prevent wrinkles. Quartz: The most powerful healing and energy amplifier on the planet. It absorbs, stores, releases and regulates energy and is useful for unblocking it. It works at a vibrational level attuned to the specific energy requirements of the person needing healing or undertaking spiritual work. Quartz is the master healer and can be used for any condition. It stimulates the immune system and brings the body back into balance. Amethyst: Is extremely powerful and protective stone with a high spiritual vibration. Natural tranquilizer. Strong healing and cleansing powers and enhances spiritual awareness. Calms and synthesizes and aids transmission of neural signals through the brain. Balances out highs and lows promoting emotional centering. Dispels anger, rage, fear and anxiety, and sadness. Promotes love of the divine, giving insights into its true nature and encourages selflessness and spiritual wisdom. This post written by Liza Jackson, Master Esthetician at Juut Salonspa in St Paul. Gemstone property descriptions source: Aquarian Soul.